Desarrollado para la guerra de trincheras. Inicialmente, el armamento iba a ser colocado en la parte frontal del chasis y los apoyos laterales. Sin embargo, más tarde se decidió no añadir apoyos sino montar una torreta. En 1943, cuando TOG 2* se había completado y estaba listo para las pruebas, ya estaba obsoleto. El vehículo nunca entró en servicio. 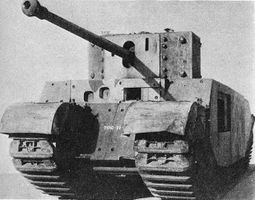 A monstrous tank capable of absorbing a near unrealistic amount of damage for its tier, the TOG II* is longer than the Maus, with armor comparable to that of the KV-1 and a top speed of 14km/h on regular terrain. This tank is not meant to be used by inexperienced players, as its terrible top speed and large size can be frustrating, but veteran players may enjoy this tank greatly, soaking up a LOT of damage. This tank is best played when supporting as a second-line tank or defending a chokepoint, because the TOG II* is just too slow for effective attacking, and is easily ambushed. It's also probably the only tier 6 tank that can survive a penetrating hit from the KV-2's 152 mm cannon. Longest tank in-game (Maus is larger by ground area, but is shorter than the TOG). It's extremely important to use this tank near the cover of buildings or mountains, as it is an artillery magnet at all times. The gun is very accurate and capable of penetrating tier 7 tanks and below. 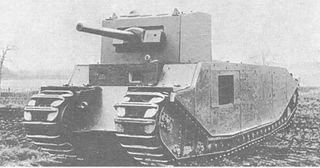 The TOG II is so big that you will be taking damage from most sources. Fortunately, the HP is so great that you will be able to absorb most of that damage while your allies takes advantage and destroy your foes. Preventing the enemy from shooting the extremly long sides of the tank (unless you manage to angle them to the point your enemies' shots bounce off) is still often key to success when driving this tank. You can play this tank's large size to your advantage. As you creep towards the enemy base you can be a perfect meat shield for allies and while the exposed enemy intends to kill you, your allies can rightly pinpoint and destroy your attackers and you can effectively roadblock a LOT of areas. Choose a spot and even once destroyed you'll ensure that you'll have blocked that path forever. This is particularly useful on maps with narrow entries. 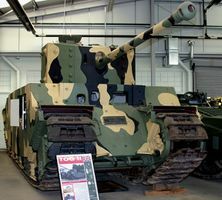 In a more competitive sense the TOG is one of the best defender/supporters of the tier. With some of the most capable all around firepower of the tier,(solid ROF, excellent pen, good accuracy and solid damage) the key to being useful beyond defense is positioning the TOG in strong firing positions to support your allies. This is easily the biggest issue that a player must deal with, as all allied and enemy tanks are capable of outpacing the TOG and might easily cause the fight to be outside its response area. However once in a good firing position near the action the TOG is hands down one of the most reliable fire support tanks of the tier. While the TOG can be deadly on its own, it is far more effective (and often more fun) when in a platoon. Note that this tank is not recommended for novice tankers.